What are the important Real Estate Terms that I should be aware of ? The Real Estate Regulation and Development Act (RERA) 2016 effective from 1st May 2017, is the law created to regulate the real estate sector. It seeks to ensure transparency and accountability in the real estate sector. It sets up clear regulations to protect the home buyers & developers against default and provides for fast track grievance redressal. A RERA Registration Number is assigned to a project after its registration with the RERA authority in the state. It is granted to projects once all required documents have been submitted by the developer and validated by the RERA authority. It indicates that a project is being developed in compliance with RERA. As per RERA, Carpet Area is the net usable area of the apartment. This excludes the area covered by external walls, areas under service shafts, exclusive balcony or veranda. However, this includes the area covered by the internal partition walls of the apartment. Built-up Area includes the carpet area, outer wall thickness and the balcony. The built-up area along with a share of all common areas such as the lobby, lift shafts, stairs, etc. proportionately divided amongst all unitsmakes up the Super Built-up Area. Floor Space Index is the ratio of the combined gross floor area of all floors (except areas specifically exempted under regulations) to the total area of the plot. It varies from locality to locality depending on the surrounding infrastructure to support the development. A higher FSI will have a higher built-up area. Loading Factor is the multiplier applied to the carpet area that accounts for a flat's proportionate share of the common area. Thus, the Loading Factor, when combined with the carpet area, leads to the super built-up area. A Clearance Certificate is used to attest that an entity/person has paid all dues and is clear of any liabilities that they held towards another entity/person. A Commencement Certificate is issued by the local authorities to a real estate developer giving them the final permit to start construction. It is issued only after the developer presents all required clearances and sanctions. It is mandatory for a developer to obtain this document before commencing the construction of a building. A Completion Certificate is issued by a local authoritystating that thedevelopment has been in accordance to the approved sanctioned plans or specifications. A Conveyance Deed is a legal document that shows the transfer of property title from one person to another. It is similar to a sale deed; however, it has a broader application. It not only covers cases where title is transferred through sale, but also includes transfer of title in case of a gift, exchange, lease, mortgage or any other circumstances. NOC is issued by any agency, organization or institute indicating the intent of not objecting with the development proposed in a vicinity. Property Card is the legal proof of ownership of land in an urban area. It contains the history of ownership of a land parcel. A sale deed is a very important legal document for evidencing sale and transfer of ownership of property in favour of the buyer from the seller. The sale deed is executed subsequent to the execution of the sale agreement/agreement for sale, and after compliance of various terms and conditions detailed in the agreement for sale/sale agreement. 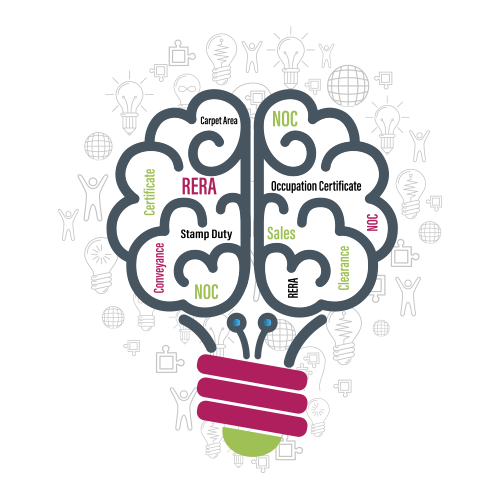 Stamp Duty is a tax levied by the government on the purchase of a property. Indian Green Building Council (IGBC) Green Homes is a rating programme developed in India, exclusively for the residential sector. The objective is to facilitate the effective use of site resources, water conservation, energy efficiency, and handling of household waste, optimum material utilization and design for healthy, comfortable & environmentally friendly homes. The Certification Levels Awarded are Silver, Gold, and Platinum based on the extent of sustainable practices followed.